The Zonerama unlimited online gallery can now import photos from the soon-to-vanish Picasa Web Albums. 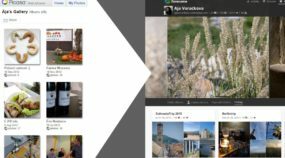 The automatic migration in just a few clicks eases the transition to Zonerama for people with hundreds or thousands of photos. About a week ago, Google announced the end of its support for Picasa. The program’s actual development already stopped several years ago, but now we’re reaching its definitive end. And if you’ve been a Picasa fan, what now?